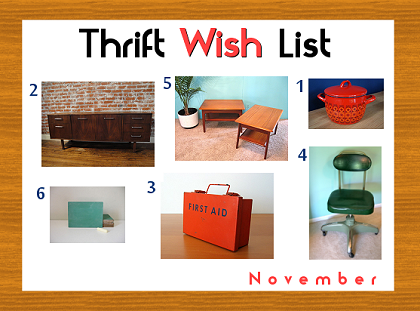 What's on Your Thrift Wish List? 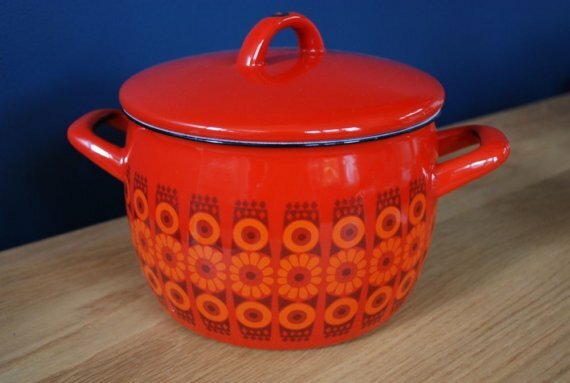 My thin, low quality, dinged-up pots are dangerous. I have to remove then handle-less lid from a favorite pot with a butter knife; both then become volatile projectile weapons. Let the hunt begin! I'm dreaming of a true landing-pad. I lose the essentials like my keys, shoes, phone, and purse every day! 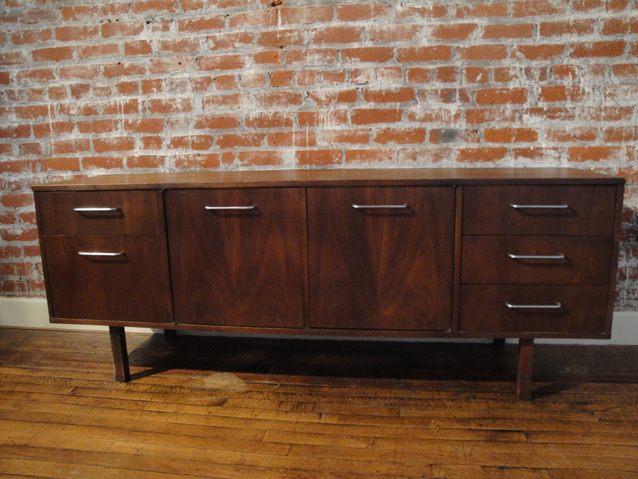 I'd love to find (or make) a sleek modern credenza where I can stash my purse, keys, and shoes when I get home. 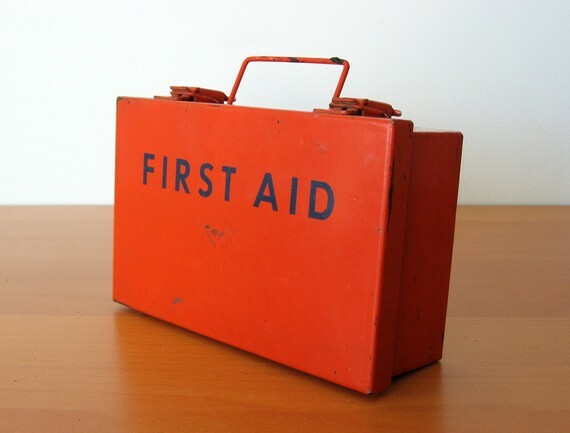 In the event of the inevitable zombie holocaust a first aid box will be your salvation. My hand-me-down Tupperware isn't cutting it for first aid storage. Likewise, my tool box is stuffed to the brim and can't even accommodate my hammer right now, so a new one is on the list. I'm starting to write at home more, and my stiff wooden chair needs replacement. Ideally, the chair is a balance of being comfortable and attractive. Comfort first! I dream of a spot for the ubiquitous combination of book, lamp, and alarm clock. With a lightning-flash twitch I can pound snooze and end the buzzing tyranny of my alarm clock (instead of literally jumping out of bed and reaching to the top of my bedside-highboy). 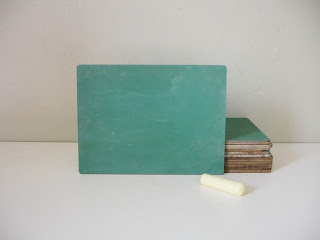 Many have suggested using chalkboard paint to create my chalkboard. No matter how simple it is, when it comes to crafting I'm very short on time. If I'm going thrifting anyway, may as well look out for a chalkboard! What are the top items on your thrift list? Let's hunt! 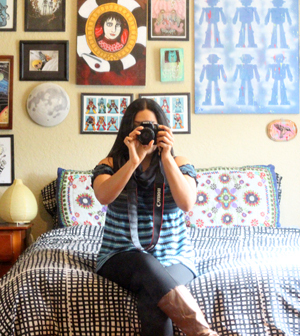 Daily thrift updates, information, and inspiration. Follow Thriftcore on Twitter. I am in the process of maing a man cave out of our garage for my husband for Christmas. So my list is pretty standard. 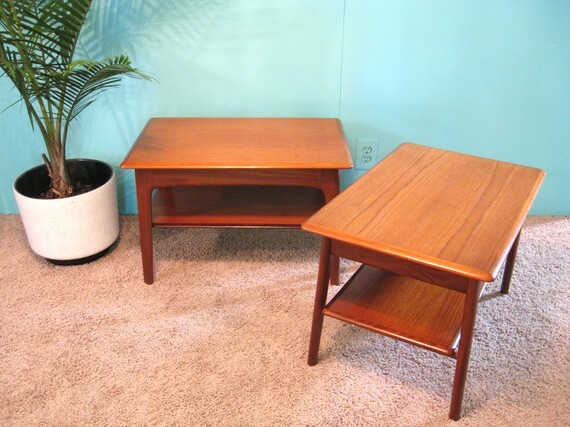 I am on the hunt for a love seat/small couch/futon, lamps that are manly, coffee table that can withstand a husband angry at a football game, tv, dart board, side table and a hot plate. That is the short version. I get to start hunting soon as the paycheck comes in. yay! Of course art and anything outlandishly unique is always on the list. And maybe nice sweaters and scarves and it gets colder! Thanks for linking up to my Commercial break! On the hunt for a television stand and a headboard! The big things are always the hardest to find. Nice thrift list, Van. I especially like the vintage first aid kit, perfect for a zombie apocalypse. I would love to find a nice winter pea coat with some faux-fur trim at an affordable price. And a pair of black knee-high boots would be great. But finding feminine shoes in size 11 wide is difficult enough at a standard retailer, let alone a thrift store! Damn my clown feet! I did find one thing one my list last weekend: a vintage red rain coat with white lining on the seams and big white buttons. It fits like it was made just for me. I'm thinking of having a photo shoot of fashion finds for the blog, once I collect enough outifts I love as much as my new rain coat. I'll let you know when I do! Ooh I love wish lists, I was recently able to tick retro credenza off my list when I got one from Vinnies for $40 (post to follow). I'd love a card catalogue, drafting chair, plan drawers, more le creuset... The list goes on! Jackie: Let me know when you find the winter goodies! I'll be looking for winter bits, too. Perhaps first searching the closet of friends and family for their unwanted clothes. 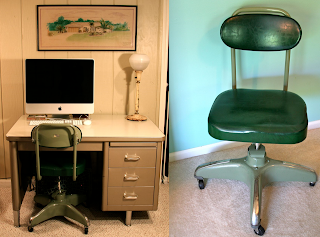 Well, in the thrift store of my dreams--the one that only exists in my head--I'm searching for an Eames chair, a vintage Heywood Wakefield coffee table, and a vintage Pucci maxi dress. In the thrift store that exists in reality I'm searching for some beautiful Weiss' snowflake pins, some dress up clothes and costume jewelry for my 5 year old niece, some vintage,floral printed tablecloths, and some antique flatware with bakelite or mother-of-pearl handles. Oh, and some vintage Thanksgiving decorations. Mary: Sounds like MY dream thrift store too, all wonderful goals! O like the idea of finding dress-up-clothes, I'm always looking for things for my nieces, they're around the same age. Geez, I don't have a list, I just kind of play it by ear. I'm not sure I had a thrift wish list until I saw yours. I think I will just copy it. Plus some old wine boxes for pretty storage.